Want to see your destination through the eyes of a local? Want to hunt down the best places to see and be seen? Want to deviate from the well-beaten tourist path and explore the more exciting side of life? In that case, you’ll want to get the Vayable Travel app on your phone before you go. Available for free from the iTunes Store. 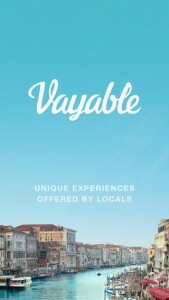 What is the Vayable Travel app? It is a simple app that achieves great things. Quite simply, you can connect with local people wherever you are and explore the best a city has to offer with custom “tourist” trips, excursions, happenings and events. We can’t help but think that this app is ideal for those interested in street art tourism. Help, I don’t have a compatible device! Don’t panic! You can access the full suite of services on the Vayable website – no app required! Requires iOS 7.0 or later. Compatible with iPhone, iPad, and iPod touch. This app is optimised for iPhone 5. Visit the Vayable website or download on iTunes. This entry was posted in Travel Advice on September 25, 2015 by worldwideinsure.